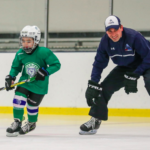 Join Coach Bill and James on Monday evenings this season for a 70-minute clinic that will combine Save Selection Shooting Drills, Power Skating, and Edge Work. 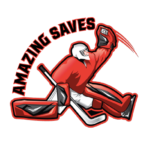 This fun but intensive clinic is open to goalies of all ages and skill levels. Once enrollment is complete coach Bill and James will divide the goalies into 2-3 groups of similar age and skill levels. This way each group will benefit from hands-on customized drills that will cater to their current skill development. Does your Goalie have a sibling or friend who plays Forward or Defense? 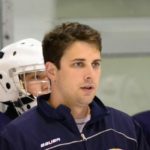 Why not have them join your goalie since We will be running this clinic in conjunction (split ice) with Kurt Nichols and his highly effective Power Skating Model for forwards and defensemen. See Kurt’s link below for more info. 35 Minutes: 2-3 stations of Game Situation Shooting Drills. Minimum of 6 goalies required for the session to be held. If a minimum is not met then this 5:30-6:50 pm clinic will be rolled into and combined with 7:10-8:20 pm session. Swivel Bursts – Forward and back (Breakaway depth) Progression: add shuffles and slides back.